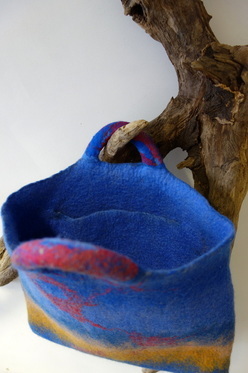 Pockets and Handles - Felt Bags. A 2-day workshop. 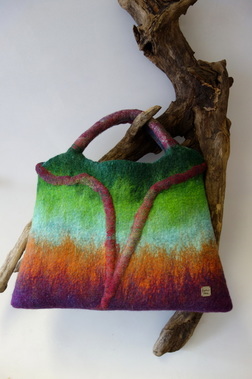 Explore the feltmaking techniques required to make a beautiful handbag, the right size and shape for your everyday needs. This project requires attention to detail, measuring and fine finishing. You will design your own unique handbag. You'll learn how to calculate shrinkage, create a made-to-measure resist, make internal and/or external pockets and integrate strong felt handles. The focus is on creating high-quality fine felt, and of course, you'll take home the perfect handbag. "Really brilliant workshop with thorough instruction. Helpful to have colour tips as well."